DPS Will Drafting makes will creation as simple as abc. Fill in some data screens then hit a button. All the necessary clauses are automatically pulled together and assembled into a professional quality will or mirror will. Simple or complex wills are treated in same way though of course more data is necessary for the complex will. This module produces all the letters, forms and documents that you need. It really is comprehensive and contains a huge pre existing precedent bank. Our software looks at a case and decides which clauses and paragraphs to use. Then it automatically builds documents tailored to your specific entered data. Of course in this case it makes Will Drafting an absolute breeze! The database is held so you are not re-keying details such as as place of marriage, name of children, executors, beneficiaries and so on. So we use contact details for all standard information making it easy to recreate a will time and time again. Of course all the standard features of DPS are there, fully electronic case file, tracking all incoming and out-going emails, capture all incoming scanned documentation. Document manage everything, cost it item by item, track it all – automatically of course. Then have it all fully integrated to Microsoft® Outlook allowing instant communication with contacts on the file, including courts, probate registries and anyone else involved in the file. When you send an email from the file have it automatically attached to the case file. Make incoming emails auto attach to their destination case file as well. What about time recording? As you might expect you get full flexibility on how to record time. Enter it manually on the screen in an electronic time sheet or let the system enter time for you because you are doing work. How about using our app to record time on the move? Your time, you choose! 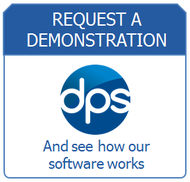 All our software integrates with DPS Financial Director, FD, to give you a complete practice management system for the firm. Fee Earners can look at ledger cards, make electronic cheque requests, record case details and enter their expenses all from within the electronic matter. FD can be added at any stage. Whats more we can convert from most legal accounting solutions. All our software uses the same SQL databases and are much more than integrated. They are a genuine ‘Whole’ solution. This saves huge amounts of time for everyone and gets everyone, back office, front office all working as a team.